Fri. Nov. 29, 2013…..After several days of unsettled weather looks like a few more angler friendly days coming up. We had several inches of rain in the mtns followed by up to 8 inches of snow in several counties. I am headed out to guide a regular client of mine from Greensboro, NC, Dr. Jim Kramer. We will be fishing 2 waters provided that conditions are suitable for it. Today we will be nymphing and streamer fishing. 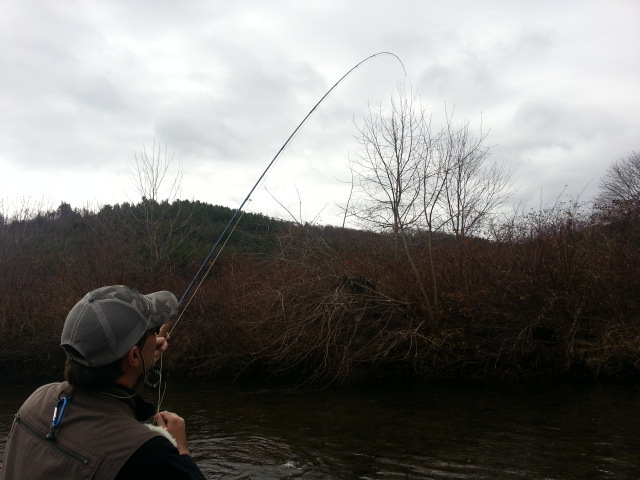 ….tossing some big uglies as well as chucking some experimental patterns. 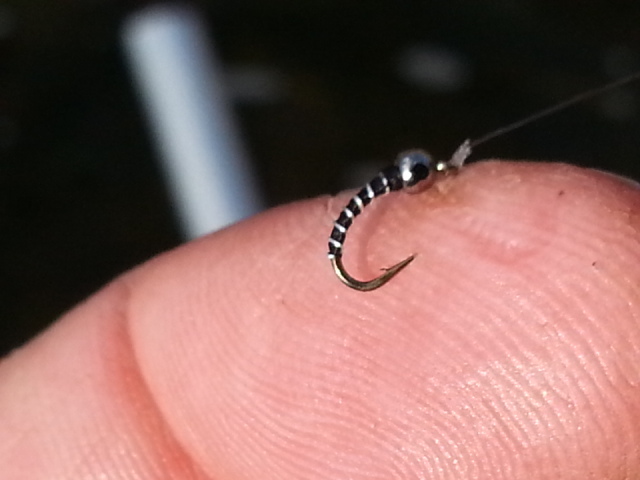 I have a grouo of new rubberleg midge patterns we have been killing them on. We’ll see if they do the same today on new water. Have a great Friday and enjoy your weekend…..more to come from the river…..
Nice Day, Bluebird Skies and Chilly…..
Fri. Nov. 29, 2013…..Cold to start, actually it was cold all day long. Water is still high but it was clear where we fished. 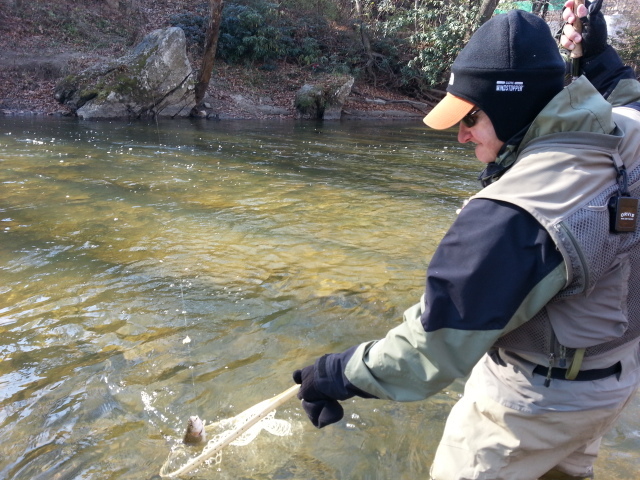 I guided Dr Jim Kramer today and we fished two different waters and did very well. We got a later start and fished the upper New and caught about 25 fish mostly on zebra midges and some rubberleg zebra midge variants. The water was up and had just a slight bit of color to it , nymph fishing was good. 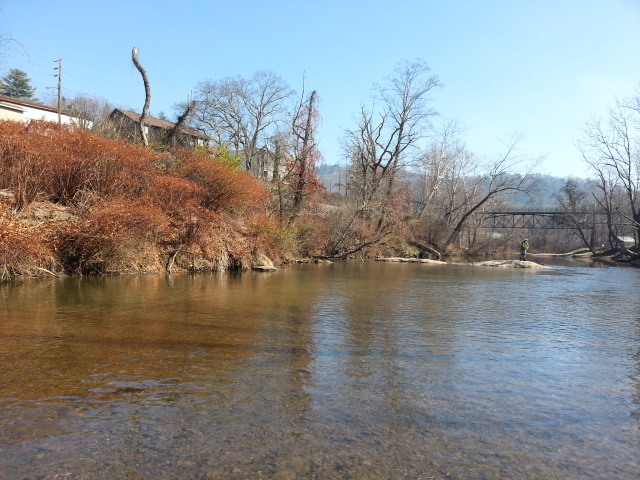 No dry fly fishing at all, maybe the 35F water was the reason. We fished in and around snow all day long as the area had snow for the past few days. Headed out again tomorrow to guide a private water Escatawba trip …guiding Scott and Hayden Roe and it should be a good day as recent rains have improved the flow there. Have a great evening and a good weekend as well! Winter is Here In Full Force…. Wed. Nov. 27, 2013…… Winter feels like its here in full force even if its not officially winter yet. Its still fall…..but it sure feels winterish. 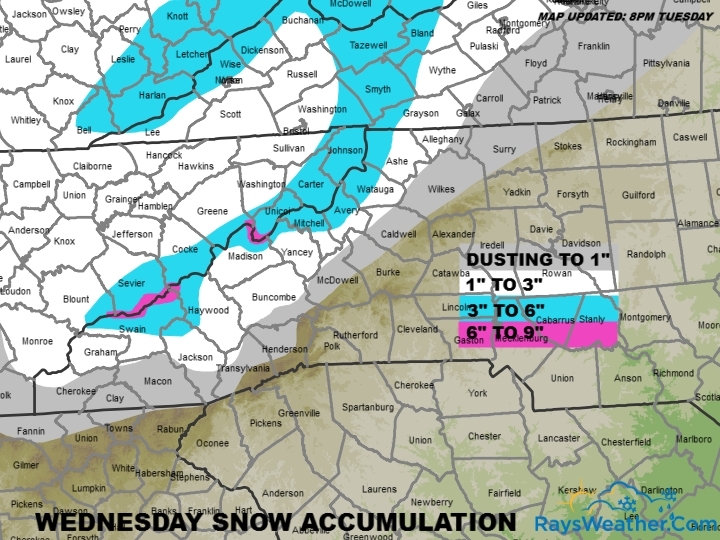 Lots of snow in the NC high country today, some areas will see up to 8″ after a Tuesday filled with sleet, freezing rain, and heavy rain. Up to 3″ of rain fell across much of the mountains. We needed rain badly, hope this did a little to remedy the drought conditions we have been experiencing lately. Knew before we ever met this morning thatThe weather folks were right on as when I met Ryan it was 17F and a stiff breeze was blowing as well. I met Ryan in Boone, NC and we were soon on our way. We opted for a 815am meet time which gave us an hour later start and that would prove a good call as we were into fish right away. Caught a fish on the first cast and it was a 15″ rainbow. The next cast Ryan rolled a 20 in plus rainbow and I knew then it was going to be a stellar day. A dozen to fifteen more rainbows there then we moved to another spot. Same result and this 20 incher Ryan rolled he landed. Landed another dozen and two more large bows that were citation sized. It was phenomenal and we had great luck on several of my new nymph patterns….one in particular I call a rubber leg white zebra midge. It smoked them. We went to another spot before lunch and landed maybe 20 more fish, a mix of rainbows, brookies, and browns…..making it a 50 fish day before lunch. After a hot fried chicken lunch, we hit two last spots and fished midges and put another 19 fish in the net. A great day….and Ryan did a great job. Not only fishing but handling the weather too as it never got above freezing. We packed it in just before dusk and headed back to Boone. What a day . Fishing is incredible right now…. We fished midges and didn’t see but one of two rises all day. Of course the temperatures were never above freezing at any point during the day. In addition to midges, and maybe a scant blue winged olive or two is all that is on the water. But larger food items are on the buffet list if you are a trout. This is the time of the year I love dead drifting big buggers or dead squirrel patterns. My dead squirrel pattern, easily our most requested custom fly pattern, is lethal on these fish and just smokes ’em this time of the year. Fishing these flies under an indicator and having a pattern tied with soft materials that breathe is a deadly technique….mainly because the soft material moves, jiggles, wiggles, breathes as the indicator bobs up and down through the chop of the riffle water. Its a deadly technique……Should I say that again…? Its a deadly technique! As mentioned, there’s been some very unsettled weather in the mtns. Snow reports are between one and 8 inches depending upon location and elevation and all that comes to an end sometime Wednesday night or early Thursday morning. Snow will be good for the water table, as was this last rain. We needed the rain badly. Back to fishing, one consistent thing the past several weeks, or should I say month have been the presence of blue winged olives. Everywhere. 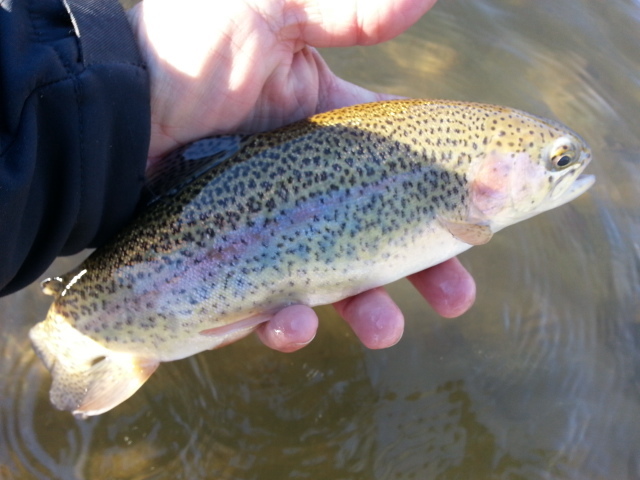 Doesn’t seem to matter if its small water or tailwaters, a noon to mid pm hatch has been the norm. And tons of dry fly opportunities. Almost every time out too. Had two days recently with clients where we encountered a hatch, one was on the New River, and we had 3 hours of rising fish and nailed fish on dries and also on dry /dropper rigs. Fall blue wing hatches are a great place to really post some big numbers of fish as the fish line up in foam lines and tailouts and gently sip the baetis /bwo emergers as they make their way to the surface. Have a great weeks end and also a very Happy Thanksgiving…! Frigid Day, Red Hot Nymph Fishing…..
Mon. Nov. 25, 2013……Knew before we ever met this morning that my client Ryan Sexton of Mathews, NC and I were going to have a very cold day. The weather folks were right on as when I met Ryan it was 17F and a stiff breeze was blowing as well. I met Ryan in Boone, NC and we were soon on our way. We opted for a 815am meet time which gave us an hour later start and that would prove a good call as we were into fish right away. Caught a fish on the first cast and it was a 15" rainbow. The next cast Ryan rolled a 20 in plus rainbow and I knew then it was going to be a stellar day. A dozen to fifteen more rainbows there then we moved to another spot. Same result and this 20 incher Ryan rolled he landed. Landed another dozen and two more large bows that were citation sized. 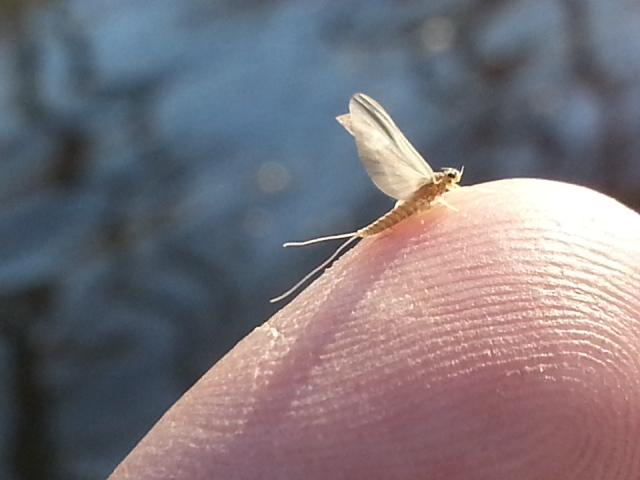 It was phenomenal and we had great luck on several of my new nymph patterns….one in particular I call a rubber leg white zebra midge. It smoked them. We went to another spot before lunch and landed maybe 20 more fish, a mix of rainbows, brookies, and browns…..making it a 50 fish day before lunch. After a hot fried chicken lunch, we hit two last spots and fished midges and put another 19 fish in the net. A great day….and Ryan did a great job. Not only fishing but handling the weather too as it never got above freezing. We packed it in just before dusk and headed back to Boone. What a day . Fishing is incredible right now….com3 experience what Ryan did….we have some December and January openings left. Some nasty and heavy rain headed our way…..and our first winter weather shot of the year. We postponed Tues and Wed trips because of it. This one is a doozy…. 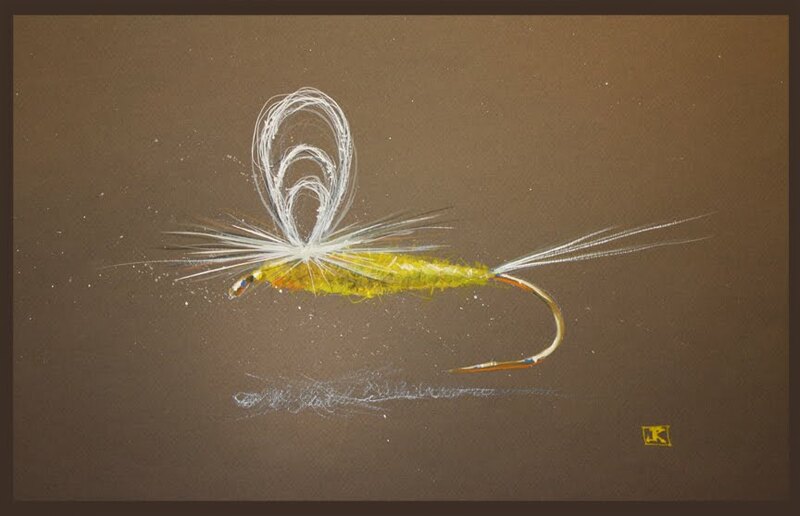 Lots of fly tying to do though……have a great evening! Cold Start to the Week….Old Man Winter is Here…. Mon. Nov. 25, 2013….Hope your weekend was great I know we had a great one. Great fishing week last week despite the cold and unsettled weather. 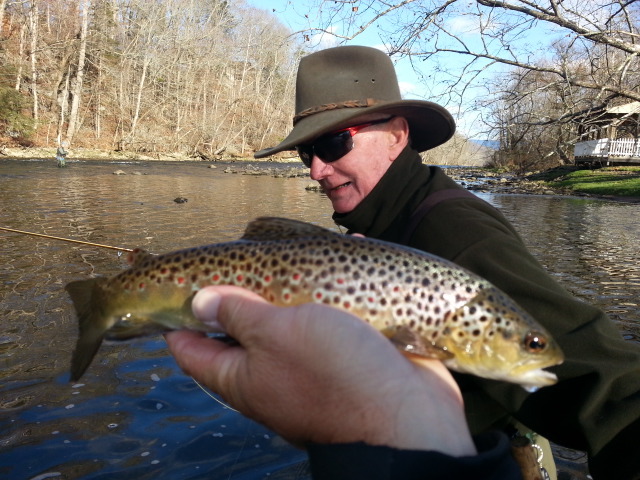 A good Saturday trip guiding Dr David Tucker and Ken Doss on the South Holston. 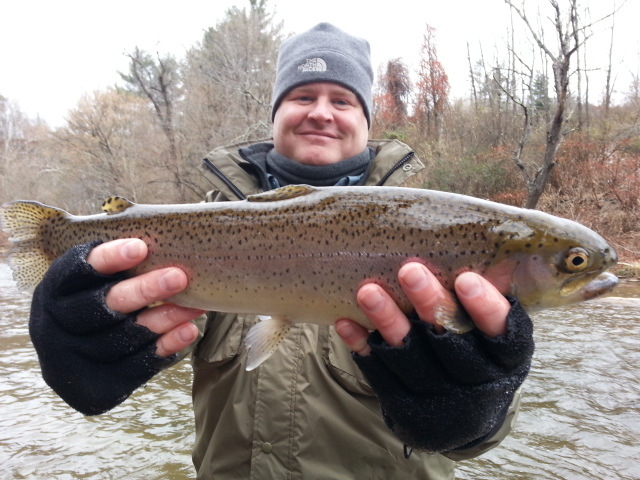 We did pretty well in cold and breezy conditions, netting between 30 and 35 browns and rainbows up to 15-17". Got a light bwo hatch, and that is only beginning over there. It will be a dry fly opportunity all winter long. And I will be doing lots of trips there because of it…! Lets go fly fishing on the SoHo this winter! A very chilly morning, 13F where I am and I am guiding a regular and favorite client Ryan Sexton. Yes its cold and will be a cold day. But my bet is we will still catch a bunch of fish. We’ll see…. Enjoy your Monday ……more to come from the water…. Sat. Nov. 23, 2013……Chilly morning guiding Ken Doss and Dr David Tucker on the Soho. 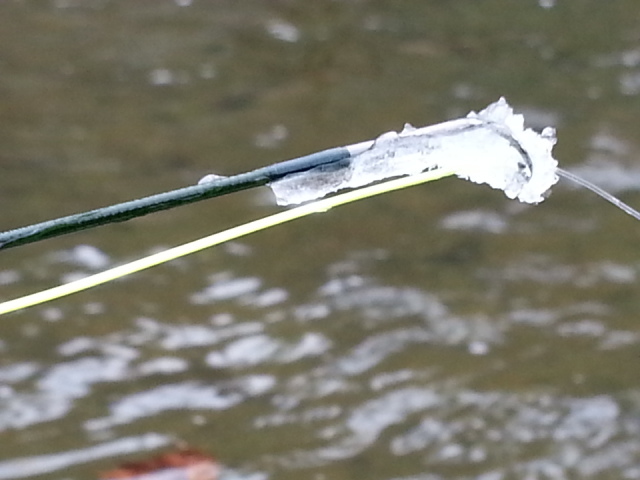 Its cold and windy and we have had slow fishing scoring 12 rainbows on midges. Headed to another spot , more to come…. 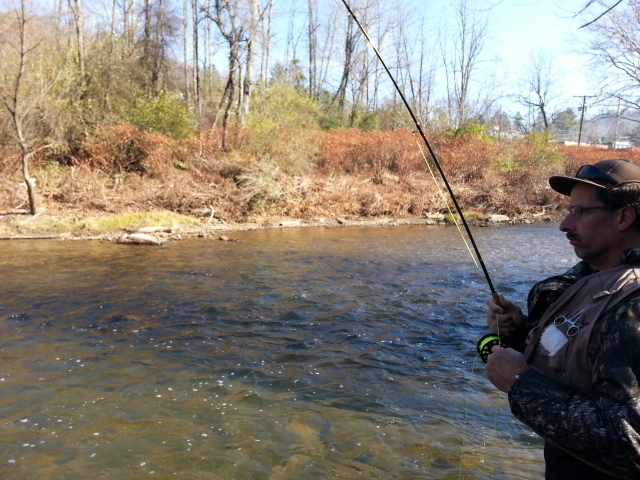 Warm Day, Great Dry Fly Action…. Fri. Nov. 22, 2013……It was quite a warm day today, almost 65F and quite a contrast to the last several days. Guided Bob Stanford today and we smoked ’em…..landed between 40 and 50 fish I’d guess. 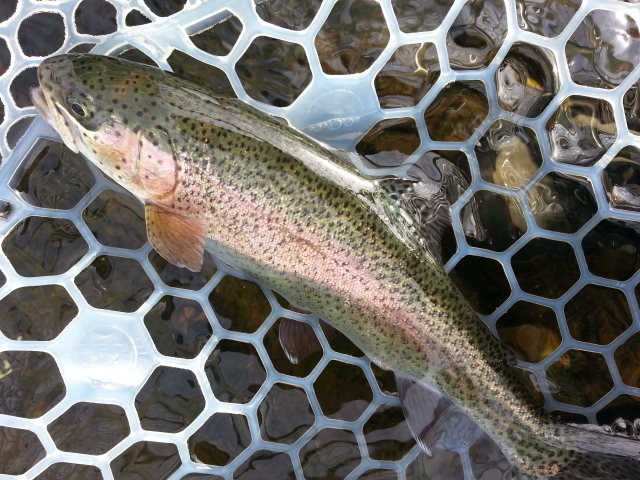 With the warm weather we caught the first half dozen fish on dry flies. 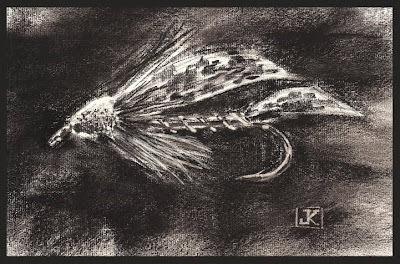 We caught a ton of fish on dries and dry/dropper combos…….smallish bwo and zebra midge patterns were king. The skinnier the better. Size 20 and smaller. It was warm to start, dry but the day just ended wet. We fished two waters and now its raining where we just finished up. Mostly light rain right now but heavier stuff to come. Great day, have another trip tomorrow guiding Ken Doss and Dr David Tucker. 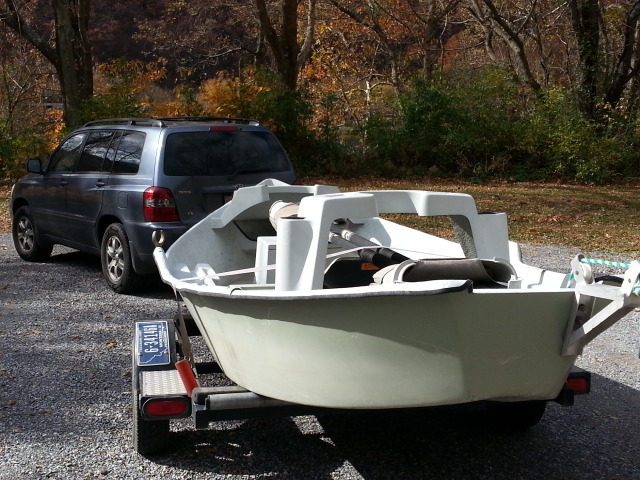 We will be hitting the South Holston. Looks like a soggy, wet day. Have a great evening and weekend! Fri. Nov. 22, 2013….Headed out early this morning, looks like some wet weather headed our way. Meeting my client Bob Stanford this morning and I will be guiding Bob today a haf day on NC water and a half day on the South Holston. Looking forward to a good day as its supposed to mild and with that we should see some good fishing and maybe some bugs coming off. With cloudy skies it should be quite good. Been seeing tons of blue wings lately and we should see little black stones any day now. They are a primary winter hatch. Looks like rain then cold headed our way. Highs in 30Fs on Sunday then it looks like potentially some mtn snow or wintry mix by midweek. Guess what that is? Normal. And it wont damper fishing one bit. More to come. …..enjoy your Friday. Great End to a Fantastic 3 Day Trip…. Wed. Nov. 20, 2013…..After a good morning despite cold temps and breezy conditions I guided Jim Beeson, Mike McKee, Mike Woods, and Dave Link to a good afternoon of nymph and streamer fishing. We had lunch and then fished two long stretches of water and did very well, had one stretch where Jim and I stalked fish and sight casted to them….and caught about 15 fish doing it. We went downstream and fished some slow deep water and caught a good many more fish, probably another 20 or so, before it started to get dark . We called it a day and headed back to the SUVs to get our gear off. It didnt take long for the temps to begin to plummet. Very chilly and there was also a stiff wind. Have a day tomorrow to reload on flies and will be tying up a storm. Then a Friday trip and Sat trip and Sun off for rest….before a busy week again next week. Where has November gone…? Wed. Nov 20, 2013…..Good morning of fishing so far we have done quite well though its all nymphing. About three dozen fish as I am guiding Jim Beeson group. Its bitter cold I would not surprised if its not an all nymph day.